While the analysis of variance reached fruition in the 20th century, antecedents extend centuries into the past according to Stigler. These include hypothesis testing, the partitioning of sums of squares, experimental techniques and the additive model. Laplace was performing hypothesis testing in the 1770s. The development of least-squares methods by Laplace and Gauss circa 1800 provided an improved method of combining observations (over the existing practices then used in astronomy and geodesy). It also initiated much study of the contributions to sums of squares. Laplace soon knew how to estimate a variance from a residual (rather than a total) sum of squares. By 1827 Laplace was using least squares methods to address ANOVA problems regarding measurements of atmospheric tides. Before 1800 astronomers had isolated observational errors resulting from reaction times (the "personal equation") and had developed methods of reducing the errors. The experimental methods used in the study of the personal equation were later accepted by the emerging field of psychology  which developed strong (full factorial) experimental methods to which randomization and blinding were soon added. An eloquent non-mathematical explanation of the additive effects model was available in 1885. Randomization models were developed by several researchers. The first was published in Polish by Neyman in 1923. One of the attributes of ANOVA which ensured its early popularity was computational elegance. The structure of the additive model allows solution for the additive coefficients by simple algebra rather than by matrix calculations. In the era of mechanical calculators this simplicity was critical. The determination of statistical significance also required access to tables of the F function which were supplied by early statistics texts. The analysis of variance can be used as an exploratory tool to explain observations. A dog show provides an example. A dog show is not a random sampling of the breed: it is typically limited to dogs that are adult, pure-bred, and exemplary. A histogram of dog weights from a show might plausibly be rather complex, like the yellow-orange distribution shown in the illustrations. Suppose we wanted to predict the weight of a dog based on a certain set of characteristics of each dog. Before we could do that, we would need to explain the distribution of weights by dividing the dog population into groups based on those characteristics. A successful grouping will split dogs such that (a) each group has a low variance of dog weights (meaning the group is relatively homogeneous) and (b) the mean of each group is distinct (if two groups have the same mean, then it isn't reasonable to conclude that the groups are, in fact, separate in any meaningful way). In the illustrations to the right, each group is identified as X1, X2, etc. In the first illustration, we divide the dogs according to the product (interaction) of two binary groupings: young vs old, and short-haired vs long-haired (thus, group 1 is young, short-haired dogs, group 2 is young, long-haired dogs, etc.). Since the distributions of dog weight within each of the groups (shown in blue) has a large variance, and since the means are very close across groups, grouping dogs by these characteristics does not produce an effective way to explain the variation in dog weights: knowing which group a dog is in does not allow us to make any reasonable statements as to what that dog's weight is likely to be. Thus, this grouping fails to fit the distribution we are trying to explain (yellow-orange). An attempt to explain the weight distribution by grouping dogs as (pet vs working breed) and (less athletic vs more athletic) would probably be somewhat more successful (fair fit). The heaviest show dogs are likely to be big strong working breeds, while breeds kept as pets tend to be smaller and thus lighter. As shown by the second illustration, the distributions have variances that are considerably smaller than in the first case, and the means are more reasonably distinguishable. However, the significant overlap of distributions, for example, means that we cannot reliably say that X1 and X2 are truly distinct (i.e., it is perhaps reasonably likely that splitting dogs according to the flip of a coin—by pure chance—might produce distributions that look similar). 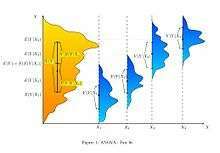 ANOVA is a particular form of statistical hypothesis testing heavily used in the analysis of experimental data. A test result (calculated from the null hypothesis and the sample) is called statistically significant if it is deemed unlikely to have occurred by chance, assuming the truth of the null hypothesis. A statistically significant result, when a probability (p-value) is less than a threshold (significance level), justifies the rejection of the null hypothesis, but only if the a prior probability of the null hypothesis is not high. the typical application of ANOVA, the null hypothesis is that all groups are simply random samples of the same population. For example, when studying the effect of different treatments on similar samples of patients, the null hypothesis would be that all treatments have the same effect (perhaps none). Rejecting the null hypothesis would imply that different treatments result in altered effects. By construction, hypothesis testing limits the rate of Type I errors (false positives) to a significance level. Experimenters also wish to limit Type II errors (false negatives). The rate of Type II errors depends largely on sample size (the rate will increase for small numbers of samples), significance level (when the standard of proof is high, the chances of overlooking a discovery are also high) and effect size (a smaller effect size is more prone to Type II error). As exploratory data analysis, an ANOVA is an organization of an additive data decomposition, and its sums of squares indicate the variance of each component of the decomposition (or, equivalently, each set of terms of a linear model). ANOVA provides industrial strength (multiple sample comparison) statistical analysis. Process inputs an investigator manipulates to cause a change in the output. Random effects model (class II) is used when the treatments are not fixed. This occurs when the various factor levels are sampled from a larger population. Because the levels themselves are random variables, some assumptions and the method of contrasting the treatments (a multi-variable generalization of simple differences) differ from the fixed-effects model. The calculations of ANOVA can be characterized as computing a number of means and variances, dividing two variances and comparing the ratio to a handbook value to determine statistical significance. Calculating a treatment effect is then trivial, "the effect of any treatment is estimated by taking the difference between the mean of the observations which receive the treatment and the general mean." ANOVA uses traditional standardized terminology. The definitional equation of sample variance is , where the divisor is called the degrees of freedom (DF), the summation is called the sum of squares (SS), the result is called the mean square (MS) and the squared terms are deviations from the sample mean. ANOVA estimates 3 sample variances: a total variance based on all the observation deviations from the grand mean, an error variance based on all the observation deviations from their appropriate treatment means and a treatment variance. The treatment variance is based on the deviations of treatment means from the grand mean, the result being multiplied by the number of observations in each treatment to account for the difference between the variance of observations and the variance of means. Several standardized measures of effect have been proposed for ANOVA to summarize the strength of the association between a predictor(s) and the dependent variable (e.g., η2, ω2, or ƒ2) or the overall standardized difference (Ψ) of the complete model. Standardized effect-size estimates facilitate comparison of findings across studies and disciplines. However, while standardized effect sizes are commonly used in much of the professional literature, a non-standardized measure of effect size that has immediately "meaningful" units may be preferable for reporting purposes. One-way ANOVA is used to test for differences among two or more independent groups (means),e.g. different levels of urea application in a crop, or different levels of antibiotic action on several bacterial species, or different levels of effect of some medicine on groups of patients. Typically, however, the one-way ANOVA is used to test for differences among at least three groups, since the two-group case can be covered by a t-test. When there are only two means to compare, the t-test and the ANOVA F-test are equivalent; the relation between ANOVA and t is given by F = t2. Balanced experiments (those with an equal sample size for each treatment) are relatively easy to interpret; Unbalanced experiments offer more complexity. For single factor (one way) ANOVA, the adjustment for unbalanced data is easy, but the unbalanced analysis lacks both robustness and power. For more complex designs the lack of balance leads to further complications. "The orthogonality property of main effects and interactions present in balanced data does not carry over to the unbalanced case. This means that the usual analysis of variance techniques do not apply. Consequently, the analysis of unbalanced factorials is much more difficult than that for balanced designs." In the general case, "The analysis of variance can also be applied to unbalanced data, but then the sums of squares, mean squares, and F-ratios will depend on the order in which the sources of variation are considered." The simplest techniques for handling unbalanced data restore balance by either throwing out data or by synthesizing missing data. More complex techniques use regression. ↑ The F-test for the comparison of variances has a mixed reputation. It is not recommended as a hypothesis test to determine whether two different samples have the same variance. It is recommended for ANOVA where two estimates of the variance of the same sample are compared. While the F-test is not generally robust against departures from normality, it has been found to be robust in the special case of ANOVA. Citations from Moore & McCabe (2003): "Analysis of variance uses F statistics, but these are not the same as the F statistic for comparing two population standard deviations." (page 554) "The F test and other procedures for inference about variances are so lacking in robustness as to be of little use in practice." (page 556) "[The ANOVA F test] is relatively insensitive to moderate nonnormality and unequal variances, especially when the sample sizes are similar." (page 763) ANOVA assumes homoscedasticity, but it is robust. The statistical test for homoscedasticity (the F-test) is not robust. Moore & McCabe recommend a rule of thumb. ↑ Anderson, David R.; Sweeney, Dennis J.; Williams, Thomas A. (1996). Statistics for business and economics (6th ed.). Minneapolis/St. Paul: West Pub. Co. pp. 452–453. ISBN 0-314-06378-1. ↑ "The Probable Error of a Mean". Biometrika. 6: 1–0. 1908. doi:10.1093/biomet/6.1.1. 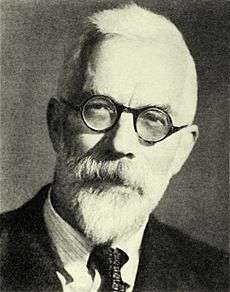 Anscombe, F. J. (1948). "The Validity of Comparative Experiments". Journal of the Royal Statistical Society. Series A (General). 111 (3): 181–211. doi:10.2307/2984159. JSTOR 2984159. MR 30181. Howell, David C. (2002). Statistical methods for psychology (5th ed.). Pacific Grove, CA: Duxbury/Thomson Learning. ISBN 0-534-37770-X. Stigler, Stephen M. (1986). The history of statistics : the measurement of uncertainty before 1900. Cambridge, Mass: Belknap Press of Harvard University Press. ISBN 0-674-40340-1. Wilkinson, Leland (1999). "Statistical Methods in Psychology Journals; Guidelines and Explanations". American Psychologist. 5 (8): 594–604. CiteSeerX 10.1.1.120.4818 . doi:10.1037/0003-066X.54.8.594. Box, G. E. P. (1953). "Non-Normality and Tests on Variances". Biometrika. Biometrika Trust. 40 (3/4): 318–335. doi:10.1093/biomet/40.3-4.318. JSTOR 2333350. Caliński, Tadeusz; Kageyama, Sanpei (2000). Block designs: A Randomization approach, Volume I: Analysis. Lecture Notes in Statistics. 150. New York: Springer-Verlag. ISBN 0-387-98578-6. Fisher, Ronald (1918). "Studies in Crop Variation. I. An examination of the yield of dressed grain from Broadbalk" (PDF). Journal of Agricultural Science. 11: 107–135. doi:10.1017/S0021859600003750. Hettmansperger, T. P.; McKean, J. W. (1998). Edward Arnold, ed. Robust nonparametric statistical methods. Kendall's Library of Statistics. Volume 5 (First ed.). New York: John Wiley & Sons, Inc. pp. xiv+467 pp. ISBN 0-340-54937-8. MR 1604954. Phadke, Madhav S. (1989). Quality Engineering using Robust Design. New Jersey: Prentice Hall PTR. ISBN 0-13-745167-9.